Please note that the TNNA Needlepoint Group will post new designs on their Facebook page from a variety of designers closer to the time of the show and eventually will update their TNNA Needlepoint website (second link below). My Pink Sugar Life posted a photo of a new ducklings canvas on Facebook. Orna Willis has announced a new pastel color combination for her "Reflections of Joy" design. She's revised the instructions to include the threads needed to create this beauty. Jude Designs has a new Nativity set that incorporates the Twelve Days of Christmas themes. It's different and interesting! Jeremies posted all four of the new Star Wars canvases from Kathy Schenkel on Facebook. Orna Willis has a new counted design! It is called "Ikat" and there are two color ways available. Needle Point Breeze's in-house artist Jackie has a new black cat canvas. Photo posted on Facebook. Sally Corey has a new travel canvas for Art Needlepoint of London landmarks. This series is an exclusive for Art NP and is printed canvases, not hand painted. Ruth Schmuff just announced four new canvases from Sandra Vargas. Accoutrement Designs has posted new magnets on their blog. Winged insects are particularly big! Kam's Handpainted Needlepoint has posted a photo of a great new firecrackers canvas on Facebook. Contact Kam via her FB page to order this cutie. My Pink Sugar Life has a new owl design for the reader in your life. Photo from Facebook. Doodlin' Around Designs has a new small lap frame that comes with two sizes of dowels to make this a more versatile frame for the stitcher on the go. Ridgewood has posted photos on their blog of the new hot air balloon canvases and more from Kirk and Bradley. Dinky Dyes has four new colors of silk floss. JP Needlepoint just posted two more florals on their Facebook page. These both came out in January. I didn't realize Painters Threads come in metallics until Ridgewood mentioned this. There are a size 4 and a size 8 braid and a metallic twist (third link below) that appears to be a chainette thread. All are in their standard array of overdyed color schemes. Raymond Crawford has a new Santa. Thread Medley's "Persian Nain Rug" chart is now available for purchase at Jan's Etsy store. If you love ethnic rug and/or counted canvaswork, this is for you! Nenah Stone Designs posted a new Easter rabbit design on Facebook. Ruth Schmuff announced a new Eleanor Grosch design plus a new color way of an older Eleanor bird. It sounds as if Ruth is doing a stitch guide for the canvas as well. Thread Pickerz is a new British hand dyed thread and fabric company. Threadaholics, have fun browsing! Needlepoint Tool Time has uploaded their new items from the TNNA show on their website. The things I haven't seen before included stitch diagram coasters (perfect for your next guild get-together!) and a needle threader with a light. Waste Knot has three new Star Wars-themed sweater canvases from Stitch Its in the shop. Cute! Osterville Needlepoint has the perfect hot beverage container on their Facebook page! Painted Pony Designs just posted four new Mary Engelbreit snow people on Facebook. They can be stitched to hold hands! Quail Run Needlework has lots of new canvases from Market on their website. Pepperberry Designs has an Easter/spring-themed holiday tree skirt. Photo posted on Facebook by Scrim Discovery Needlepoint. Pocket Full of Stitches has new canvases order at Market in the shop, including Julie Mar, Leigh, MAP, and Quarter Stitch plus the new darning stitches book from Finger Step Designs. Kreinik just announced five new colors of their Japan Thread #5. This couching thread resembles metal threads but is easier to use. Make sure you click on the photos to see the colors better. They are yummy! Ridgewood Needlepoint showcases new reindeer and tallis bag canvases from Market. These are not in stock, they will have to be ordered. There is also an interesting canvas of a Victorian girl with a fan and cat at a garden gate. Sorry, the designer names are purposely omitted by Ridgewood. You can pick these up via Orna's Etsy shop (second link below). Here's a brand new Nenah Stone design of a church with sheep. Barbara's Needlepoint just posted a new Cindy sign on their Facebook page-- "It's Not Nice to Be Mean." Needle Delights Originals just posted another new design on their blog. This is "Poppers" and it comes out this month at the February Cross Stitch show in Nashville. Painted Pony just posted a new Mary Engelbreit design on Facebook. This is "Watching Together." Ada at Eye Candy just posted about various clubs and classes using her wonderful designs but at the very end, she threw in two new canvases for us Texas and peacock lovers. 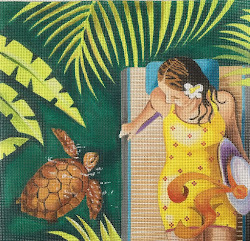 Sally Corey Designs has a new travel-themed design for Art Needlepoint. This one is NYC. Painted Pony has added a bunny with a daffodil and Cupid to their Facebook page. These are both from Mary Engelbreit. A display of West Fern Designs (distributed by Point of It All Designs) has been posted to Facebook by Jermies Needlepoint and Linens. If you like classic designs and monograms you'll want to check this out. Needlepoint for Fun also has a new canvas from Vicky Mount for those with a cat who bosses the dog around. Painted Pony Designs posted photos of two new Mary Engelbreit canvases (a lamb and a Scottie) on Facebook. The e-newsletter for Amy's Golden Strand for Feb.-March 2016 is out and talks about all the fun at Market. Nimble Needle in New Jersey shows off new Kelly Clark items just received in the shop. Orna Willis has new plush felt ball scissors fobs available now. Kathy of Needle Delights shows off one of her newest counted canvaswork designs that will be released at the cross stitch trade show in Nashville shortly. This is "Sudoku Delight" with all its color ways. It was a teaching piece originally but now you can stitch it at home. Vicki Day Designs has a new overdyed silk ribbon color, "Kelly's Copper." It's lovely! Maggie has posted new designs from their newest artist, Holly Wojahn, on Facebook. If you like floral still lives with birds, you'll want to check these out. Lucinda Gregory has a new website. Have fun exploring! One Off Needlework just released a new charted kit in honor of Queen Elizabeth II's 90th birthday. The design is intended to be worked in wool on 10 count needlepoint canvas. Supplies and the chart are included in the kit. Pocket Full of Stitches posted photos of a few new Zecca canvases that have arrived in the shop on their blog. These include some of the new domed bird canvases that are a special favorite of mine. ...six new colors of Silk Lame Braid, in all three sizes. Robbyn's Nest Designs has created a photo album of music-themed canvases on their Facebook page. Some are new, some are not, but they are all wonderful. Funda Scully posted two photos of new decorative cow skulls on Facebook. This is a Southwestern icon! Kelmscott has updated their website with their newest items, including a nice folks art rooster magnet and two charming mermaid scissor fobs. I didn't realize Mrs. Blandings has so many great needlepoint designs. Contact her to purchase using the contact info at the bottom of the page. Sorry to be late to the party! Isn't this a great American flag all in rectangles from Patty Paints? Carolyn Hedge Baird posted it on Facebook. It's new in Chaparral if you shop there. b>Deux Bijoux Bijoux has updated their website with the new trays and frames and purse handles and much more that came out for various designers at the San Diego show. Enjoy! Kirk and Bradley just posted a darling stitched version of their new Asheville, NC ornament on Facebook. Needlepoint Designs by Angela's Facebook page has her new gingerbread designs. Angela Shaddon also does finishing and you'll see some of her work here. She also has an Etsy shop (second link below). Little Bird Designs has new floral pieces. You can see these designs in their Facebook photo album. Kathy Brandt has a new Surfin' Santa. It can be painted on either 14 or 18 count canvas. Zecca has a new section on their website for heart designs! Head over to fall in love. JP Needlepoint posted photographs of their new series of Wild and Wicked Witches canvases on Facebook. Needle Nicely has posted new canvases on their blog. You can see lovelies from Raymond Crawford and Zecca at the link below. Ridgewood shows off pages from the new "Winter" stitch diagrams book from the Landscapes folks. They also will preorder the two new Carole Lake/Michael Boren books for you. Sally Corey Designs has a new Rio de Janerio travel design posted on Facebook. This is distributed by Art Needlepoint Company. They specialize in quality printed needlepoint canvases. Louise's Needlework has updated their New From Market photo album on Facebook with new items from Associated Talents. Pocket Full of Stitches shows off the newest Birds of a Feather designs that have arrived in the shop. The Needle Nest just got a new Clementine Hunter canvas in stock. I'm not sure if this is newly adapted to needlepoint, but the angels are charming regardless. Kreinik has added two new colors of shoelaces to their line honoring Charles Austin Kreinik. A portion of the proceeds of sales of these unique shoelaces made from Kreinik metallics will go to help those who suffer from alcoholism and depression. Ruth Kerns Books' newest e-newsletter has a great shot of the new Winter stitch book showing several of the stitch diagrams available, plus lots of tempting book reviews. Warning! Ruth makes every book sound wonderful! My Pink Sugar Life has six new ornaments featuring animals in winter scarves for your stitching pleasure. Personally I love the puffin! Orna Willis has added new scissors fobs to her Etsy store. Pocket Full of Stitches shows off new magnets, needle threaders, etc. from Puffin and new canvases from Unique New Zealand. Little Bird Designs posted three new floral and a bird ornament on their Facebook page. Melissa Shirley just posted photos of seven new Vicki Sawyer animals on her Facebook page. Barbara's Needlepoint just posted a new "leopard" rabbit from Cindy on their Facebook page. This is a shop exclusive. There is also a smaller version that's plain white (second link below). Victori-Anne's Treasures posted photos of new magnets and a bead-needle case from Accoutrement Designs on Facebook. Painted Pony posted two new Mary Engelbreit stockings on Facebook. Purple Palm Designs shows off two photos of their new sachet series canvases on Facebook. CBK has added new Edie and Ginger ornaments and signs to their Facebook photo album. Needlepoint For Fun has a new artist--Catherine Nolin. Pocket Full of Stitches just posted photos of more new items that they ordered at the trade show. These are from Canvas Art by Barbi and by Beck/And More. BB Needlepoint Designs has updated their website with their 2016 designs. Kreinik shows off their five new colors of metallics and explains a bit about how they choose the colors they add to their lineup of threads. Right now these are only available in size 12 but they will be coming in other braid sizes shortly. Rebecca Wood has updated her website with her newest canvases. Sweet! What's the Point? Needlepoint just posted photos of their newest acquisitions from Market on Facebook. Louise's Needlework just posted photos of their newest acquisitions from Market on Facebook. Ridgewood posted a group of new Lani canvas photos on their blog. Since Lani's not updated her website, this is a welcome show of sofas, chairs, watches, vanity tables, and more. Eye Candy has updated their website with their newest treats. Lorraine of Colour Complements has announced seven new colors of threads for spring. They are soft pastels in the main, plus two grays, one with touches of turquoise. Folks who love choosing their own color combos for charted designs or someone who wants an orange that is just a little different for their Halloween pumpkins should take note. Alice Peterson has updated their website with some of their newest items. Jody Designs has updated their Etsy page with new ornaments. >New "Happy Hopper" rabbits from JP Needlepoint, posted on FB. Pocket Full of Stitches just got in new Kelly Clark and Kristine Kingston designs from Market. They are pictured on their blog. Tisha posted photos of 8 of the latest Danji models from the trade show on Facebook. CBK Needlepoint Collections has added more new designs to their Facebook page. Stitch By Stitch in Larchmont's latest e-newsletter has photos of the things they really liked at Market at the very bottom. More Santa Helper Elves from dede Odgen have been posted on Facebook. Sandy Arthur does a brief review of the TNNA show in San Diego on her blog, along with glimpses of her current and upcoming cyber classes. Ehrman has added their newest designs to their website Sale section. Have fun browsing! Nimble Needle in NJ has posted a great photo of the new variegated shades of Pepperpot Silk. Me want all! Pocket Full of Stitches shows off the new colors of Capri, Entice, and Silk Lame Braid from Rainbow Gallery and the new books from Carole Lake and Michael Boren, all now available at the shop. Kelly Clark shows off her new designs and her new partnership with Colonial Needle, which has resulted in colors of their Finca floss and perle cottons. The Kelly Clark website has been updated, too. Chaparral has three new Prairie Schooler Santa canvases in stock, straight from the trade show. Nimble Needle in NJ shows off new Sandra Gilmore/Fleur de Paris designs just received by the shop. Laura Perin shows a sneak peek of a new design in her American Quilt series--"Calico Stars." BeStitched in Arizona shows off some of the things they have on order from the TNNA show in their latest e-newsletter. EyeCandy has updated her website--and what fun it is! Michelle at Come to the Point does a quick mini-review of the two new books from Carole Lake and Michael Boren in her latest e-newsletter. Theresa of Homestead Needle Arts shows off some of the booths at Market in her latest e-newsletter. Devon Nicholson Design's newest e-newsletter talks about her newest canvases. If you want to see more, visit her website (second link below). Good Harbor Needlepoint has posted quite a few photos from the trade show on their FB page. Stitch By Stitch Larchmont has updated their Facebook page with more photos from Market. Barbara's Needlepoint shows off the leopard hearts from Ann Hansen which were created for the shop. Suzie of Enriched Stitch shows off photos from her TNNA class. Pocket Full of Stitches brought all these back from Market. Available to buy right now. Warning: Hide Your Credit Card Before You Look! Stitches in Time has updated their Facebook page with photos from Market. Needlepointing in Your Nest (that's Carolyn Hedge Baird for those of you familiar with her books, classes and stitch guides) has updated her Facebook page with photos, many of stitched models, from Market. Painted Pony Designs has updated their Facebook page with lots of great booth photos from Market. I didn't know Petei did Judaic designs, that Funda Scully had sorority headbands, or that Painted Pony was developing a series of Beyond Basketweave canvases with stitch guides for the adventuresome stitcher. TNNA's NP Group has posted booth photos from Lee, Kreinik and Treenway Silks. Amy's Golden Strand updated their Day 2 Market folder on Facebook just now. Pepperberry has nine new snowmen designs. Pocket Full of Stitches shows off even more things from the third day of Market on their blog. Pepperberry has new baby designs. NP Group of TNNA has posted new booth photos for Leigh Designs, Dream House Ventures, Threadles, Fleur de Paris, Creative Needle, Rainbow Gallery, Barbara Bergsten, Susan Roberts and Patt and Lee. Some of the brand new Point of It All Designs canvases are in the trunk show at Ridgewood. Here's the newest counted canvaswork design from DebBee's Designs. It will be available to order in February. I don't know the designer but someone has acrylic base lamps with canvas inserts. Use the right arrow to see another photo. What's the Point? Needlepoint has added lot of photographs to their FB page. The Needle Bug has added lot of photographs to their FB page. Amanda Lawford shows off her booth and two new designs on FB. The Nimble Needle-Atlanta is also updating their FB page with new goodies. The Meredith Collection has posted photos of three new ocean-themed canvases on FB. In Stitches Atlanta has posted photos of things they loved at Market on their FB page. Village Needleworks has updated their FB page with lots of cool photos they've taken at the TNNA show. You'll see some great finishing and items no one else has photographed. The French Knot posted a few photos of things they really really liked at Market on their FB page. Quail Run shows off the class models from the TNNA classes they took. Ewe and Eye just posted their "General Store" design on Facebook. Kirk and Bradley has a whole series of new hot air balloon designs. Brenda Stofft has a new snowman in his Christmas house design on her FB page. Robbyn's Nest Designs is adding photos of new designs to her FB page. Pepperberry has four new holiday houses. Orna Willis has added a new bead collection to her Etsy store. The beads appear to be larger and the color combos are sophisticated. You also get the PDF version of Orna's Needlepoint Emellishment book, making this a nice little bargain. Beads AND ideas--win/win! The beads with book items all have "Bead Collection and Book" in their descriptive title in Orna's Etsy store. The Needle Works has updated their blog with photos of new goodies. Needlepoint.com is also posting photos on FB. The Nimble Needle-Atlanta is also updating their FB page with photos. Stitches in Time has updated their FB page with photos of things they liked. TNNA's Needlepoint Group is posting more booth photos. Cheryl Schaeffer has new bottle stoppers with tiny canvases and snow globe canvases Use the right side arrow to see more. Amy's Golden Strand is still updated their FB photo album "January Market 2016 Day Two." The Meredith Collection (formerly Elizabeth Turner Collection) has added more new canvases to their Facebook page. Leigh Designs has updated their website with their new Crown Jewels series. Click on the photos that have "stitch guide" under them to see the stitched models. All guides listed are available from Leigh already when your shop orders the canvas from LD for you. Pocket Full of Stitches published a lot of photos of new items they've ordered on their blog. Stitch by Stitch Larchmont just featured Kathy Schenkel's mini duffle bags in their e-newsletter. Amy's Golden Strand has set up a new album for photos from Market Day 2 and started uploading photos to it. Two new Asian themed canvases from Meredith Collection. Fish canvases from Artists Collection. Frogs canvas and matching frame from Robbyn's Nest. A. Bradley's great new country canvases with the flag colors as background stripes. Tisha of Needlepoint Tool Time films the Deux Bijoux Bijoux booth and frames that coordinate with canvases. French hens from the Point of It All Designs! Sundance shows off the ladies behind the fun on Facebook. The Nimble Needle-Atlanta is adding more photographs to their FB page. More Zecca from the Nimble Needle Atlanta. The Artists Collection shows off new designs on their FB page. A Stitch in Time Needlework posted more photos of things they liked on their FB page. Sundance shows off three models of their canvases in their booth. A model and matching frame in the Ewe and Eye booth. A glimpse of the Annie Lane booth. The Quarter Stitch shows off the Clementine Hunter designs displayed in their booth. Painted Pony won an award for their "best decorated" booth. The Needle Works is posting new design that caught their eye on the shop's FB page. New horses design from Laurel Burch/Danji. Cynthia shows off new dede Odgen canvases on FB. I really like the double-sided wizard. Nimble Needle Atlanta is posting photos of their favorite market finds on their FB page. Don't miss the Colors of Praise monkeys! The Artists Collection shows off their Bees Knees tote bag with a pocket for a stitched design. Raymond Crawford shows off some of his Christmas ornaments and elf designs. Labors of Love posted a photo of their three large Halloween stand ups from their booth. A Stitch in Time shows off some uncredited canvases (Colors of Praise?) including stunning new Asian designs. The Needlepoint Group of TNNA has posted booth photos on Facebook showcasing Julie Mar, The Point of It All Designs, Kathy Schenkel, and Maggie. The Meredith Collection shows off two new Art Nouveau designs on Facebook. Rainbow Gallery posted the new Alice Peterson Indian Owl and their new Entice colors used on it on Facebook. Raymond Crawford has updated his website with his newest treats. Note his Wizard of Oz set. It must be the Year of the Wizard! Colleen at Needle Works posts about the first day of Market on her blog. Don't miss the Sandra Gilmore Wizard of Oz snowmen set. Needlepointing in Your Nest has added some nice photos of booth models to their Facebook page. Eight new Alice Peterson delights have been posted to Facebook. Use the side arrows to see them all. Orna Willis has added amazing scissor fobs to her Etsy site. What's the Point? has added a photo album of new things to their Facebook page. The Artists Collection has posted photographs from their booth on Facebook. Kathy Schenkel Designs posted two photos of new canvases in their treat bag series on Facebook. Amy's Golden Strand updated yesterday Market Day One photo album on Facebook this morning. Latest photos at the end. ...and a Vicki Sawyer/Melissa Shirley owls model that I am sure was stitched by Carolyn Hedge Baird (I see her trademark bee signature) so there will be a guide for this. Knotted Needle shares a display of new Kathy Schenkel mini socks with matching felt inserts on Facebook. Love the drinks ones and the little fox! NP Group of TNNA posted photos of the Tapestry Fair booth on their FB page. Amy Bunger does a quick (very positive) mini review of the two new Carole Lake/Michael Boren books on her personal FB page. Lisa Krause has updated her Deux Bijoux Bijoux website with many new frames created for a lot of designers. She isn't just working with Maggie any more. Two more frames have been posted on Facebook (second link below). And More has updated their website with all their new designs. Julie Pischke shows off photos of the Colors of Praise and Canvasworks booths on Facebook. Pocket Full of Stitches shows off a wide variety of items they have ordered from the trade show on their blog. UPDATE on how to see all the Stitch by Stitch Larchmont TNNA photos on Pinterest. You have to have an account to view. Two new photos of Sew Much Fun models. Use the right arrow to see photo 2. Gayla Elliot's Santa wreath. Use the side arrow to see the stitched model. Tapestry Fair's new Menorah canvas, posted on FB by Colleen Church. This comes in several sizes and shapes (second link below) including a stocking and individual lights. Hug Me Bags shows off their new Tony bag, modeled by Tony Minieri. 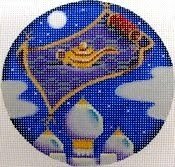 Created with the traveling needlepoint teacher in mind! The second link is a video showing the bag, courtesy of Needlepoint Tool Time. Models of Associated Talents' darling duck ornaments. Two new canvases from Birds of a Feather on Facebook. A look at the Quail Run booth on Facebook. Michelle of Little Bird Designs shows off their most popular new design on Facebook. Patty Paints showed off a photo of new canvases in their booth on Facebook. Needle in a Haystack posted a photo of Kelly Clark's Winter Chalk ABC Sampler on Facebook. Park Avenue Needlepoint posted six photos of new items they picked up at Sample It yesterday on Facebook. Painted Pony Designs just posted two new Mary Engelbreit designs on Facebook. They say they have an Instagram page where they are posting in case you happen to have an account. No idea what the address for that is as they do not say. BeStitched Needlepoint just posted 32 photos of magnets and needle cases from Accoutrement Designs on FB. Many are new but not all. Cynthia Thomas shows off Sew Much Fun's new "spool" ornaments on Facebook. Village Needleworks is adding photos of various things they've seen to their FB page. Robbyn's Nest Designs shared two new canvases on their FB page. Use the right arrow to see the other one. More shots of the new Leigh crowns. The Carolyn Taggart model is in the comments. The model with the rose is Sharon Quick's and the one with the orb is Sandy Arthur's. All three stitch guides are available from :Leigh. The Meredith Collection (Elizabeth Turner and Treglown and Charley Harper) posted set up booth shots on their Facebook page. The Needle Bug posted a variety of photos of new things on their Facebook page. The canvases are from & More and the tool bags are Ashland Sky bags from Leigh Designs. What's the Point? Needlepoint posted a photo album of new CH Designs/Danji pieces on their Facebook page. Ewe and Eye posted a photo of their booth on Facebook. Needlepoint Group of TNNA posted photos of Melissa Shirley's booth on Facebook. The Needle Bug really likes the new artist Tapestry Fair is representing. Stitch by Stitch Larchmont is posting photos of their favorites on Pinterest. You will need an account to see them. Amy's Golden Strand has added to their Sample It photo album and added a new album for January 2016 Market Day One. Kangaroo Paw Designs shows off their newest sorority licensed designs and their new mitten shapes on Facebook. Louise's shows off new "lollypop" style models with Easter themes from Pepperberry. Burnett and Bradley posted a photograph of their booth on Facebook. Garden Gate Needlepoint posted six photos of Kelly Clark models on their FB page. Needle Works of Austin is posting photos of new designs from Leigh, Lani, Patti Mann's new artist Rose Hill Designs by Heather, and Julie Mar. The Needlepoint Group of TNNA is posting photos of various booths on their FB page: Rebecca Wood, Melissa Shirley, Zecca, Pepperberry Designs, Little Bird, Elizabeth Bradley/Kirk & Bradley/Burnett and Bradley are the ones listed now. Pocket Full of Stitches shows off the new items they bought at Sample It. Little Bird Designs' display at Showcase. Melissa Shirley Designs has updated her website with new designs. Juli Poitras has updated her Facebook page with views of her booth and of the trade show. One of Melissa Prince's movie coasters, finished as a pillow. Two Julie Mar photos, one of the designer and one a closeup of a model. Two new counted canvaswork designs from Threedles. Another new Leigh Designs crown model. I think this was stitched by Sharon Quick. Use the side arrow to see Sandy Arthur's model. Fleur de Paris/Sandra Gilmore/Rainbow Gallery/Carole Lake & Michael Boren new items at Stitchers Showcase. Sheena shows off her favorite new canvases from the Winter 2016 show on her blog. The Elegant Needle just posted the Halloween model from the class they took at TNNA today. This is Burnett and Bradley's design, taught by Ruth Dilts and Joan Lohr. The second link shows two different finishes. Danji just posted their Sample It display from CH Designs on Facebook. If you like Christmas pieces, you'll love these from the Santa's Workshop set! Kreinik has posted a photo and a video of their booth set up on their Facebook page. BREAKING NEWS! Meredith Willet just announced on Facebook that she's bought Treglown Designs, which includes the officially licensed Charley Harper canvases. These companies and the Elizabeth Turner Collection will all be under the Meredith Collection name henceforth. Kate Dickerson/KSH Needlepoint Collections just announced she has licensed art from Patience Brewster for needlepoint canvases. You can see five canvases on her Facebook page and more are to come. Pre-orders will be taken at the show. Park Avenue Needlepoint just posted four photos of Kelly Clark models on their Facebook page. I think they saw these at the trade show. Stephanie posted several new designs from Ewe and Eye on her blog, which is very nice for those who love samplers and don't "do" Facebook. Thanks, Steph! The Artists Collection has posted a new bird canvas on Facebook. Thet promise more new designs shortly. Labors of Love has updated their website with all their new Winter 2016 designs. Little Bird Designs shows off their stitched and framed Hope Over Fear design on Facebook. Labors of Love also shows off a lovely rounded dimensional Santa on Facebook. This might be new as I've never seen it before. Labors of Love shows off their Lea Witch, stitched by Laurie Walden, so there will probably be a guide available by Laurie. Painted Pony just posted a photo of a Funda Scully Nativity set that will be at the trade show this weekend on Facebook. Sundance just posted a photo of their Sample It kit for the trade show on Facebook. This is "Retro Radiance" and shops will be able to buy the kits (until Sundance runs out) at the Sample It evening. Painted Pony just posted a new Christmas doghouse with Scottie dog design from Mary Engelbreit on Facebook. JP Needlepoint posted three new "brick bag" purse designs on Facebook. TNNA's Needlepoint Group has posted two new designs from Kirk and Bradley and Burnett and Bradley (same people, different company names). Amy's Golden Strand is promising to post all sorts of wonderful things on their Facebook page during the TNNA show. Here is the direct link. I don't know if this will work if you don't have a FB account yourself but there's nothing I can do to stop the migration of most needlepoint information there. Gay Ann Rogers has new Downton Abby inspired geometric designs back on sale on her website. I'm not certain how long these will be available so act quickly. Threedles has posted two color version of La Mision, a new design for 2016. Enriched Stitch shows off the Susan Roberts and Associated Talents classes that Suzie will be teaching shop owners at Market and that will be probably both taught at the shop in 2016. Robbyn's Nest Designs has posted four photos of the little designs with matching frames that will be available at the "Sample It" sale during the TNNA show. This is cash and carry, where shops pick up things they can bring home with them. Most items at the show must be ordered but not these. Of course when they run out, they are gone. Tapestry Fair has posted a sneak peak at some of their new designs on their blog! Kreinik promises new colors of their threads will debut in San Diego so they have a new metallic color card. JP Needlepoint posted photos on Facebook of two new "eclipse" designs. TNNA's Needlepoint Group has posted ten photos of new Dream House Ventures canvases on Facebook. These are all geometrics for tablet covers and glasses/phone cases I understand. Little Shoppe Canvas Company has a new book out. It's called "Winter" and has stitches for snow, candy canes, angels, bells and bows, holly and much more. If you loved their "Stitch Landscapes" or their "Ins and Outs" books, ask your local shop to order this for you. Melissa Prince has posted a sneak peek at new designs on her Facebook page. Patt and Lee has posted over 40 new canvases on their Pajamas and Chocolate Facebook page. 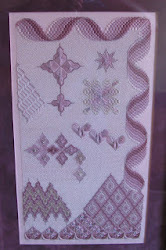 Ewe and Eye and Friends just posted a new Historic Needleworkes sampler design on Facebook. Kate Dickerson/KSH Needlepoint Collections just posted a series of five new blue shell designs on her Facebook page. JP Needlepoint posted their new "Pig and Apple" design on Facebook. Julia Snyder just posted on Facebook that she has a new book coming out called "Keys to Canvas Embellishment," that there are going to be new thread and canvases lines coming out from & More, and that their current threads will have new looks and pricing. TNNA's NP Group posted this new Painted Pony canvas from Diane U. Petersen on Facebook. Pepperberry Designs just updated their website with their new designs. Joan Lohr and Ruth Dilts will teach this Burnett and Bradley (formerly ACOD) Halloween canvas at the trade show. JP Needlepoint shows off their new Package Santa who has a front and a back side. Kate Dickerson shows off her preppy take on election year canvases on Facebook. These premier at the trade show in a week. Amy Bunger is going to post progress photos on her Facebook page as she stitches this Diane Pedersen design from Painted Pony. Patt and Lee has posted two new designs on their Facebook page--I like the 1960s style Colorful Cats but traditional stitchers will love the patchwork rooster. Raymond Crawford has a new bird series. They posted the finch photo on Facebook. Three new CBK designs from three of their fabulous artists! A new design from Patt and Lee--the cutest owl ever! Owl Stitchery posted four new Annie Lane designs with Mary's guides debuting next month on Facebook. Robbyn's Nest Designs posted a photo album of new items on their Facebook page. Sign of the Arrow posted a photo of an exclusive canvas from Goodnight St. Louis on their Facebook page. Tango and Chocolate shows off some of their newest scissor fobs, available at the trade show. Purple Palm Designs just posted a new portrait of a lady on Facebook. It will be available to order in January. Painted Pony will have Palma Seljan's Southwestern Nativity on display at their booth at TNNA. You don't want to miss seeing it in person! Here's a new Maggie mandala piece--"Wag the Dog." Carol Gantz will teach this Associated Talents hearts piece at the TNNA show in San Diego. Devon Nicholson has posted a new design called "Santa's Reward" on Facebook. If your idea of Santa is him eating the cookies you left out, this one is for you. A dozen new Dream House Ventures painted canvases have been posted to Facebook by TNNA's Needlepoint Group. Use the side arrows to browse them all. Rainbow Gallery shows off a new dede Odgen rabbit canvas and their new colors of Capri on Facebook. This is the Flower Sampler class the designer Kelly Clark will be teaching at TNNA. The canvas and I think the guide will be available after the show. TNNA's NP Group just posted a new Christmas design from Associated Talents in their patterned Christmas words series. Fun! Barbara Elmore shows off a new product to be distributed by Sundance Designs starting in January--stretchy plush velvet ribbons! The ribbons are a quarter inch wide and available in ten colors. Kathy Rees just showed off part of her next mystery class on Facebook. Sandy Arthur shows off one of the new line from Leigh Designs. Sandy will teach this at the TNNA show in January. Juli Poitras just posted another new design (a still life called "Bowl of Zinnias with Pears") from JP Needlepoint on Facebook. Elizabeth Turner Collection has added a donkey to their animal portrait series. Love the expression! The Quarter Stitch just posted a festive holiday alligator on Facebook. I think this is an original design for the shop. TNNA's Needlepoint Group just showed off glimpses of new designs from Artists Collection on Facebook. You can see new items from Heart Strings, Bees Knees and Mile High Princess. Barbara's Needlepoint just posted Ann Hansen's new snowman on 13 count. Sally Corey just announced a new travel series of printed designs for Art Needlepoint on Facebook. Here are two of the series. Orna Willis is going to make her bead storage vials and boxes available for purchase empty, as well as filled with glorious colors of beads! If you need sturdy bead storage, check these out. The Needlepoint Group of TNNA has started showing off new designs for January on their Facebook page. These are two designs from Tapestry Fair: Kelly Rae Roberts' "Trust the Journey" and Manuel Salas' "Ophelia." Use the side arrows to see both designs. JP Needlepoint posted a photo of six new "Christmas Animal" ornaments to their Facebook page. Two camels, two moose (meese?) and two pigs. Kelly Clark shows off her new "Stumpwork Flower Samper" which she will be teaching shop owners at the TNNA show. Lucky them! Needlework Unlimited just posted photographs of their new "Learn A Stitch" ornament kits on their blog. The kits come with everything except stretcher bars and tacks and you can even buy those as a kit separately. The second link below is to their website in case you need to order a quick present for yourself or a friend. If you want to see most of the new Mary Engelbreit canvases from Painted Pony in one place, Ridgewood just got a shipment in stock. Rainbow Gallery just posted the cover of Michael Boren and Carole Lake's second new book, Twisty Stitches Part One, on their Facebook page. (There are so many string art stitches that this will have a second volume.) Rainbow Gallery is the publisher of their books. Ada Hayden of EyeCandy shows off two new designs on her blog. Both designs have birds in Ada's signature happy colors. Fleur de Paris just posted eight photos of new "Santa's Helper Elves" on their Facebook page. I think these are from dede Odgen but the posting doesn't say. CBK Needlepoint Collections has three new magnets based on Scott Church designs. You can see the photos on their FB page. Liz Morrow of LizArt has a new Bargello design that is FREE! It is called "J&M Bargello Pattern" and can be downloaded from her website. Ro Pace has a new counted piece available for purchase. It is called "Bout Time" and you can see a photo of it being worked by Sharon Quick on Facebook. Here's another from Purple Palm. This is called "Adriana." Juli Poitras of JP Needlepoint is stitching away on a piece to show off at the TNNA show. Barbara Elmore is going to add spiral bound notebooks to her Zazzle store. The cover will be decorated with one of her stitched models. Painted Pony Designs shows off one of their Lynne Andrews pieces called "Autumn Lighthouse" on Facebook and says there will be a companion piece with a patriotic theme released in January. Canvas Art by Barbi shows off a piece from their new "patch" series on Facebook. JP Designs is showing off two new Persian rug style motif canvases on Facebook. These and more will be available to order in January. Speaking of magnets, Down Sunshine Lane has a new batch of needle minders for your viewing pleasure. They don't make magnets but they specialize in selling them. (They also sell scissor fobs and counted thread charts.) They gather magnets from a huge number of sources, some one of a kind, so they are a great place to find something really different. Most of their magnets come from Rogue Needlepoint, I think, like these Hannukah-themed magnets. EyeCandy shows off their new ornaments that will be featured in the January-February 2016 issue of Needlepoint Now magazine. Ruth Schmuff showed off Kimberly's new scarab design on Facebook. Barbara Elmore shows off another Lindsay Pratt fairy. These will be released in January by Barbara's distributor, Sundance. Leigh Designs has released her November Surprise--four new "Seashore Santas!" I think four more will be released in June 2016. The Collection Designs has updated their website to add Patty Paints (they are distributing her now) to their line of designers. They also have a lot of new pieces pictured on their home page. Painted Pony Designs just posted a new Lynne Andrews' design called "Snowmen Choir" on Facebook. Will be released in January 2016. There's also a new "Beary Christmas" from Lynne Andrews. Quail Run Needlepoint just posted a new design on Facebook that will come out in January from Nancy Coffelt. It's a modern patterned squirrel in a sort of William Morris background. Very nice! Raymond Crawford Designs just posted photos of three new stylized owl canvases on Facebook. Use the side arrows to see them all. Raymond Crawford Designs has finished his sleigh full of elves and toys. It will be released in January. Melissa Shirley Designs has posted a brand new design on her Facebook page. This is "White House Cove." Painted Pony Designs just posted photos of three of Lynne Andrew's new Winter Bird Ornaments on Facebook. Use the side arrows to see them all. Painted Pony Designs just posted Diane Ulmer Pedersen's "Winter Sheep" on their Facebook page. CBK has posted 10 photos of new magnets based on their canvases on their Facebook page. Use the side arrows to see them all. Counted Canvaswork Alert! Terry Dryden has added a new kit to her website--"Baroque Diamonds." The kit is at an introductory low price and her other kits are on sale right now, so if you want some Terry color in your life, do a little browsing. Pepperberry Designs just introduced a new Hanukkah Holiday House. Many thanks to Victori-Anne for showcasing this on Facebook! ...and Peacock Alley both have posted photos of new designs honoring France. This one is from Kristine Kingston. Barbara Elmore posted a photo on Facebook of the newest Lindsey Pratt's Dinky Fairy which is called "Thread Fairy." Painted Pony Designs posted a photo of Diane Ulmer Pederson 's "Night Sheep" to their Facebook page. Wollworks has restocked their stuffed pumpkins made of vintage needlepoint. They also sell pillows featuring vintage basketweave pieces. TNNA's Needlepoint Group just posted four photos of new seasonal Zecca designs on their Facebook page. Use the side arrows to see all four. Paula from Kelmscott Designs has posted two new magnets and a miniature set of red scissors on their website. Nenah Stone Designs has posted her new "Poinsettia Donkey" design on Facebook. ...and an ornament featuring a bear all wrapped up for winter with his toy giraffe. Mary also has the Christmas lizard. ROFLMAO! Lisa Ferguson of MyPinkSugarLife just announced on Facebook that she'll turn a photograph of your house into a gingerbread house. Contact her via her Etsy page (second link below). Painted Pony Designs posted a photo on Facebook of their newest Diane Ulmer Pedersen design. BB Designs just showed off a new beach house design for January on Facebook and updated their website with all the new 2015 designs (second link below). Laura Perin has a new counted holiday design for her fans to enjoy. This is called "Holiday Gifts" and also is charted for a blue/silver version for Hanukkah. Quail Run the shop just posted three new mini socks that I think are from Quail Run Designs. Brenda Stofft has a new Santa--driving a rocket ship! You can see it on her Facebook page. Sally Corey has added to her line of Pucci-inspired designs distributed by Julie Mar and Friends. JP Needlepoint just posted the new "Princess and Her Packages" design on Facebook. Love doxys and Christmas? This is for you. © Copyright 2016 Jane M. Wood. All rights reserved.